There has and always will be a debate over "THE" rear wing. No wing, factory 1993 wing, factory 1999 wing, high flying GT style wing, or some other variant. The debate rages. 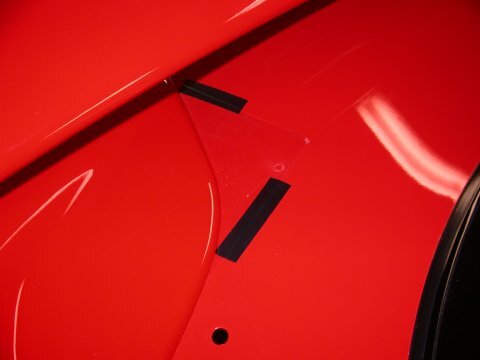 Some may argue that for the utmost effectiveness and functionality the GT wing rules. This might be true if you regularly top 140mph or your car can actually go 140mph at all. Or possibly you want a lot of downforce at low speeds at the expense of some increased drag. 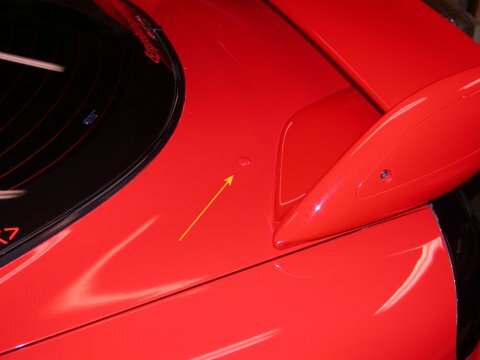 A properly designed and installed GT style wing, or at a minimum a wing that generates real downforce, is pretty much a necessity once you start nudging 140mph regardless. Then there is the other question of aesthetics. Why put a full blown GT wing on a car driven on the street? All you are doing is inviting ridecule from those ignorant enough not to know you actually might "track" the car. Unless of course you want a show car. But I don't have a show car so does aesthetics matter? Well to me it does in part. I believe the angular GT style wing destroys the smooth rounded lines of the 3rd generation RX-7...my opinion. 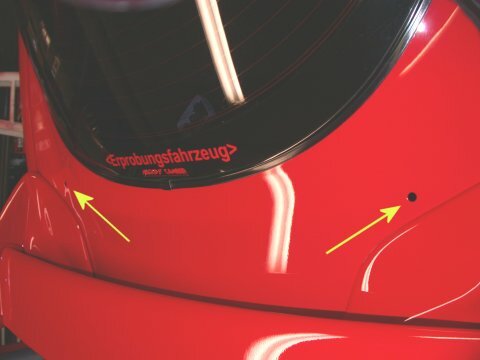 So how to get some of the functionality of a REAL rear wing without blodging up the look of the car? 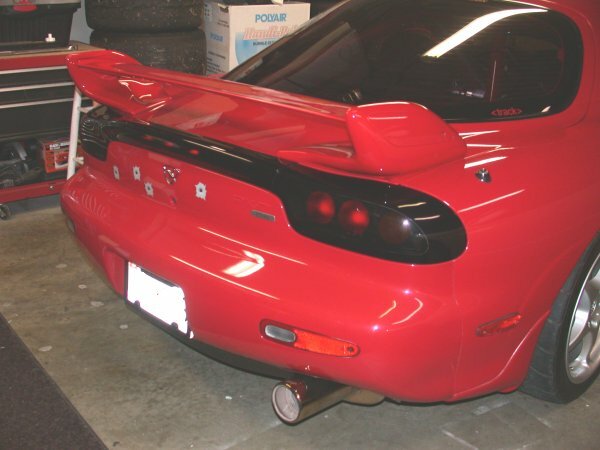 The solution in my mind is the 1999 Mazda factory rear wing. This wing is actually a functional wing that I think looks terrific. Unlike the 1993 "lip" wing, which was mostly, if not all, for looks, the 1999 wing actually generates real downforce. Not as much as a functional GT style wing (I say functional because there are many GT "style" wings that aren't functional at all) but functional nonetheless. 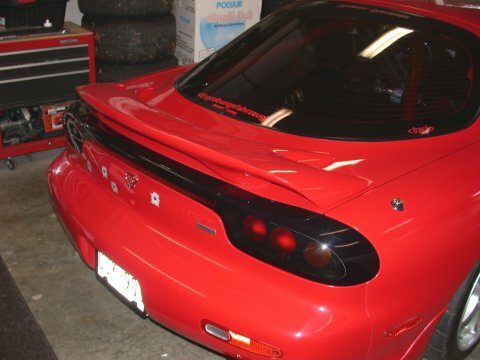 The factory 1999 wing is made of urethane not fiberglass, a big plus in my opinion, and it comes painted in the factory colors to match your car so no worries or expense about visiting the paint shop. A FEW ROUGH CALCULATIONS I have some wind tunnel data for the '99 RX-7 equipped with the functional rear wing. 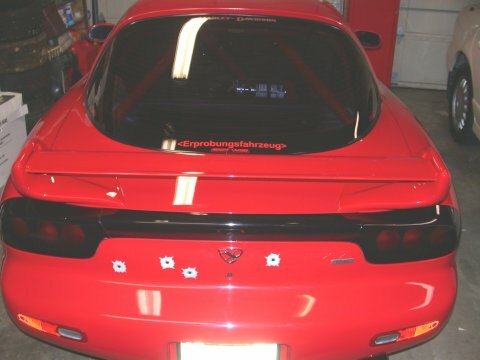 This is Mazda's own wind tunnel data taken from a 1999 Japanese promotional video. After some difficulty with the translation it was deduced that the information was in fact lift coefficients for the front and the rear of the car. So using these numbers I did some really quick and dirty calculations and found them quite interesting and thought I'd include them here. It's interesting to note as the rear downforce increases (more negative lift) there is a small pitch change in the car tilting the nose up and causing a bit more lift in the front end. Makes sense to me. Also note the MANY other factors play into these numbers: ride height, front rake, spring rates, etc.. But with these numbers I did bit of scribbling. Consider the car with dimensions approx. 170"x70" (168.5" x 68.9" to be exact) or about 82.6sqft of surface area. So split the surface area in half and do the math to determine lift. Like I said VERY quick and dirty! Roughly speaking at 140mph the front end of the car gets "lighter" by 110lbs and the rear end of the car gets "heavier" by 155lbs if using the wings maximum angle of 14.5degrees. So with a weight of 2800lbs with 50/50 weight distribution putting 1400lbs on each end of the car, at 140mph the car "weighs" 1290lbs in the front and 1555lbs in the rear. I did a similar calculation with a generic/averaged wing lift coefficient of 1.5 for just the wing itself and determined that the wing alone is is capable of generating about 200lbs of rear downforce. Neato stuff, eh? Use the Cl values provided by Mazda (listed above) for the whole car with the surface areas noted previously to get ground force on the front and rear of the car. As a comparison some data for the 1993-1995 model years taken from 'Race Car Aerodynamics' by Joseph Katz on page 18, shows that Mazda did quite a bit or aerodynamic tweaking for the 1999 model year as the lift numbers are much improved. These include most notably; the front nose, the front undertray w/airdam, the front lip spoiler, and the rear wing. INSTALLATION Perhaps the beauty of a factory part is you know it will fit perfectly. So the worries about sanding here, grinding there, are gone. Simply bolt on and go. Well not quite, but close enough. The lower interior hatch trim must be removed first. This is nerve racking as the trim is popped in place using metal spring clips and much care must be taken not to snap the plastic trim or deform it such that it bends and leaves a white bend line. 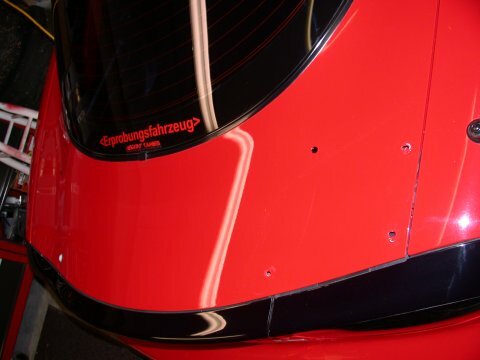 There are also a few push pin type clips hidden under the upper half of the hatch trim. So the upper trim must be partially "unsnapped" near the deck strut supports in order to access the clips. Once the trim is removed the '93 wing can be unbolted. This is comprised on two phillips head screws on each outer side, a 10mm bolt on the forward inner stancheon, and two hidden white plastic clips for the rear inner stancheon. Once you have broken...err, removed these clips the wing can be lifted off. Staring at a naked hatch you see the 8 holes... and the scuff marks where the old wing sat. Bummer. Time for a little wetsanding to clean up the paint as best you can. No need to do it all, just the areas no longer covered by the '99 wing supports - basically the front of the old wing inner stancheons. With wing removed the 8 mouting holes are visible. Wet sanding the rough paint where old wing was mounted. With the paint cleaned up the '99 wing is fairly easy bolt up exercise. 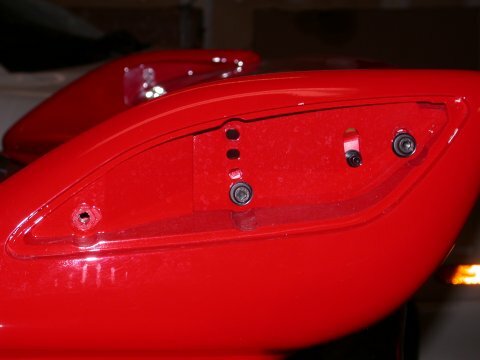 Six of the existing eight bolt holes align with the mounting holes on the 99' wing perfectly. All one need do is drill the remaining 2 holes. DRILL! Unfortunately yes...drill. How does one know where to drill the two needed holes? Using double sided tape *lightly* attach pieces of clear overhead plastic to the underside of the new wing. With a permenant marker, mark the location on the clear plastic where the mounting holes on the underside are located. Place the wing where it is to be mounted on the hatch. I bolted it down using the existing holes in a few places to make sure it was in the right place. Now firmly tape the clear overhead plastic to the hatch. Hard to see but [left] a piece of clear plastic stuck to a wing support with double sided tape and with the hole marked and [right] wing now bolted down and plastic stuck to rear hatch ready for wing removal. 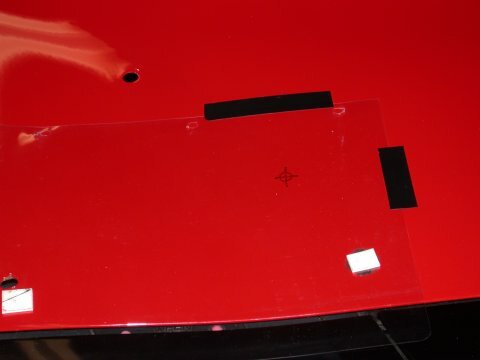 Remove the wing, separating it from the clear plastic, which should now be stuck to the hatch and which will indicate where the new holes are to be drilled. As painful as it may seem, drill the holes. I used some black RTV around the newly drilled holes to keep the water away from the exposed metal edges when the wing was bolted in place. 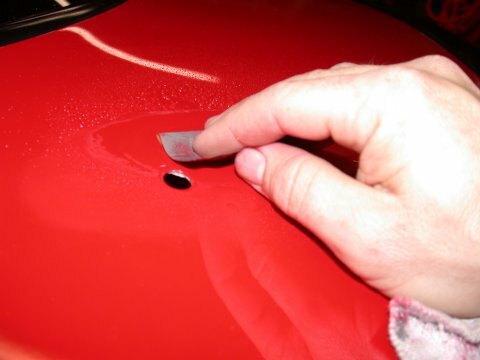 In fact rubber washers should be used on all the bolts to stop water from coming through into the hatch. Now it's just a case of mounting the the new wing. 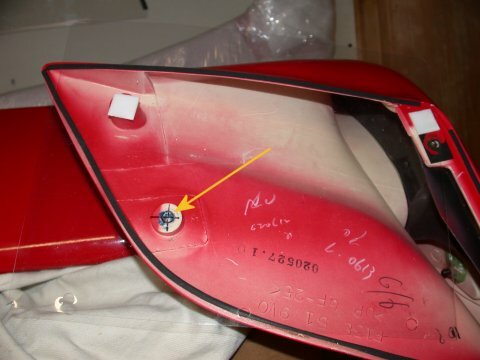 With wing removed and plastic stuck to rear deck the location of the new hole is clearly marked. So go ahead...drill the new hole! Don't worry too much about the new hole because if you ever decide to go back to the old '93 style wing, the new hole will be covered up. Now only one issue remains...and this is a tough call. 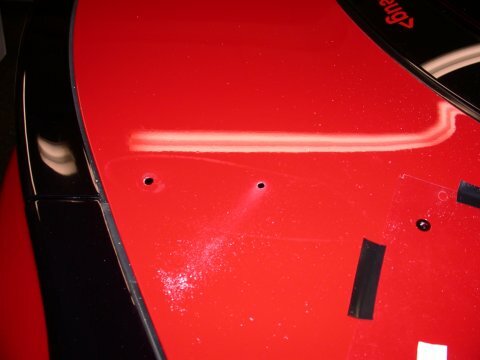 By removing the '93 wing 2 of the 8 mounting holes are not used and are left exposed after installing the '99 wing. 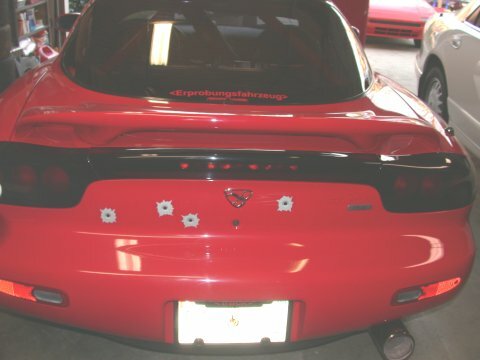 The proper way to deal with these are to fill, sand, and repaint the whole rear hatch. $$'s!!!! In my case I found some low profile plastic plugs and painted them over a 4 day period (1 coat a day) with 4-5 coats of touch up paint to match the car. Not as pretty but only cost a few cents. Out with the old...and in with the new.